IMG_5612, originally uploaded by kristenhenschen. I just completed another aisle runner last night. This one is for Christina, a Chicagoland Area bride that found my runners on my ETSY site. Christina’s colors are canary yellow and ivory, which actually show up quite well against the subtle damask pattern on the runner. I love how it turned out–and more importantly-so does the Bride! 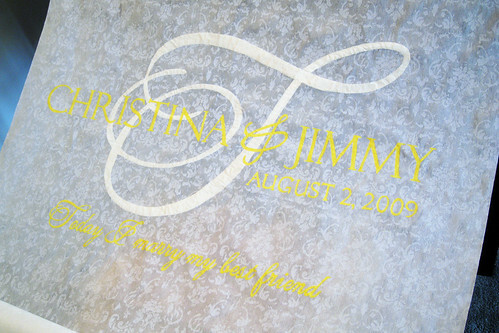 I recently picked up my aisle runner from Kristen and I simply love it!! The wedding is not until August 2nd, 2009, but Kristen is very pleasant and definately artistic (as you can see). I recommend it to everyone and very affordable! I LOVE IT!!! Thanks again Kristen!